Pregnancy is a time of massive changes for every woman. Not only are you growing a whole new human being inside of you, your own body is also undergoing immense transformative processes. More than anything, you have a torrent of various hormones coursing through your blood flow, bringing about a wide range of side effects on your body, including your skin. The ways in which pregnancy and childbirth affect your skin will vary from one woman to another; still, there are some universal rules that can aid you in keeping your skin in a relatively normal state during this 9-month rollercoaster ride of emotions. To get you started, we have prepared a list of tips that should illuminate and explain some of the most common skin-related issues that occur before and after childbirth. The moment you find out you’re going to be a mommy, it is time to reevaluate a lot of your day-to-day habits. Not only will you have to pay extra attention to your health and your eating habits, you’ll have to re-think your skin care choices, as well. If you tend to use a lot of beauty products, chances are some of them won’t be friendly for your skin now that you’re carrying a baby. And to find out whether your favorite cleanser or moisturizer is pregnancy skin-friendly, all you have to do is inform yourself about overly strong ingredients, then pay extra attention to the label on the back of your products. If you still have doubts while you’re browsing your local drugstore for new skin care products, you can always navigate towards formulas designed for sensitive skin to avoid any unwanted effects. The practice of avoiding overly potent skin care ingredients should continue into the nursing period, as well. If you’re not sure whether it’s safe to start using certain products after you’ve given birth, it’s best to consult your doctor just to stay on the safe side. 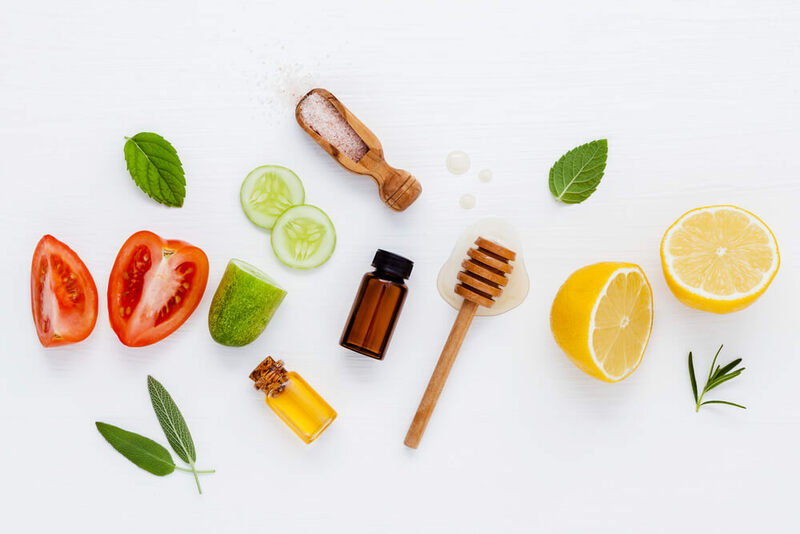 Luckily, a lot of the times, these “to buy or not to buy” dilemmas can be solved by simply gravitating towards natural options that will enhance the look of your skin without introducing harmful toxins in your beauty routine. Whether that’s skin-drenching face masks, satisfying lip scrubs or DIY under-eye patches, there are many ways to treat your skin which don’t involve formulas created in labs. And to help you make the first steps towards a nature-focused beauty routine, here are some of the ingredients that can help address the most common issues that arise in pregnancy. Vitamin E is one of those much-talked-about skin boosters that, due to its amazing reparative properties, can tackle a range of skin problems, including tissue breakage, acne and patchy texture. Aloe Vera, a soothing gel derived from a succulent plant of the same name, has the ability to sooth inflamed skin and even reduce redness and irritation. Jojoba oil can perform the double duty of repairing your skin and replenishing it with moisture, making this nutrient a welcome addition for women who are experiencing extra dryness during these months. Pregnancy is a time where women are experiencing increased amounts of hormones rushing through their bloodstream. The effects of these changes may manifest themselves differently in different people; however, some are more common than others. For example, a frequent side effect of hormonal changes is the appearance of red, blotchy areas on the skin. This condition is known as rosacea, and it usually occurs in individuals who have fair, irritation-prone skin. Some women may suffer from rosacea before conceiving, then have their symptoms exacerbate during pregnancy. Others may develop this skin condition due to hormonal imbalance and stress that occurs while pregnant. Whatever the cause, traditional treatments for rosacea, such as Accutane or strong antibiotics, are not suited for women who are pregnant or breastfeeding. Because of this, you will have to seek other, more natural remedies to soothe your redness. Luckily, there are various methods to help you ward off inflammation and other symptoms of rosacea. When it comes to skin care, look for products that contain nature-derived ingredients with soothing and anti-inflammatory properties. Natural remedies such as Aloe Vera, cucumber extract and honey can provide relief for your skin and minimize the appearance of red patches. Due to various hormones that are running amok in the body during those nine months you’re pregnant, your skin will probably be more prone to irritation, spots and blackheads in this period. And since tackling the internal factors that are causing your skin to act up might be tricky, the least you can do is minimize the outside irritants that might be aggravating your skin. The best place to start doing that is your makeup. For example, if you’ve gotten used to doing a full beat on a daily basis, perhaps you should take it down a notch. Since chances of acne and breakouts may increase in this time period, lathering up on pore clogging foundations and powder might not be the best solution. Still, this doesn’t mean you should completely forgo your favorite skin-pepping products. You just need to make a couple of tweaks in your routine so it’s more pregnant skin-friendly. For example, swap your full coverage foundation with a featherweight BB cream or tinted moisturizer. Not only will a product like this even out your complexion, it will also feed your skin with various nutrients and protect it from environmental irritants. Also, you can avoid over-powdering your face by focusing the product only on the areas that tend to get oily throughout the day (in most cases, your chin, nose and forehead). If you want to fully liberate your skin, forgo base products and focus on quality skin care to achieve that flawless, radiant complexion. This way, you can still emphasize certain points on your face (like eyes or lips), without needlessly piling on huge amounts of product on your skin. You’d be surprised what a smidgeon of brow gel and a touch tinted lip balm can do! A common skin care woe that occurs during pregnancy is hyperpigmentation, or increased production of melanin in certain areas on the skin. This condition, most often referred to as melasma, is also a side effect of the hormonal changes that are happening in your body during pregnancy; women who tend to have darker skin are more likely experience symptoms of this condition. Melasma typically manifests itself through dark spot and patches on the face (usually above the lip, around the nose and forehead) and other areas of your skin. Even if, at times, it may seem like your hyperpigmentation will never go away, the symptoms usually fade after childbirth. However, if you are already feeling too self-conscious about your dark patches and are too impatient to wait, there are ways you can minimize the symptoms and mitigate further damage. Before anything else, sunscreen is key. Providing your skin with a protective barrier will keep it protected from harmful UV rays, which can only further emphasize the hyperpigmented areas. When choosing your sun blocker, make sure to read the labels and stay away from any formulas containing oxybenzone, as it shouldn’t be used during pregnancy. When out in the sun, always arm yourself with a hefty pair of sunglasses and a wide-brimmed hat to ensure physical protection for your skin. One of the most common changes in your skin after delivery will be stretch marks and slightly looser skin that developed as a result of your body rapidly changing during those nine months. Naturally, your body and skin will take some time to bounce back to their regular state, but you can definitely speed up this process with a couple of handy skin care methods. The first one would be to stock up on creams and lotions loaded with firming and repairing nutrients. An especially effective one for fading stretch marks is Vitamin E, which has the ability to repair the skin and accelerate cell renewal. Due to its tightening properties, coenzyme Q10 can be a great addition to your skin care if you’re looking to make your face and body look smoother and firmer. Getting rid of uneven texture and flabbiness can be achieved through other means, too. For example, light exercise can also assist you in regaining tight, smooth skin texture you’ve had prior to getting pregnant. However, before you decide to partake in any kind of physical activity (whether that’s during pregnancy or after childbirth), you should definitely seek advice from your doctor first. Period after childbirth also comes with its own unique set of skin care challenges. For example, you can rest assured that you won’t take sleep for granted once you finally have your bundle of joy home with you. And sleepless nights can quickly manifest themselves in form of dark, puffy under-eye circles which can definitely be a nuisance for all the new moms out there. Luckily, there are ways to tackle this common symptom of sleep deprivation. To begin with, you can invest in a nourishing eye cream which can be applied as part of your PM skin care routine. Simply pat the product on you’re the affected area using your ring fingers, starting from the outer corners of the eyes moving inwards. If you’re still experiencing some puffiness in the morning, you can make a soothing DIY relief by freezing a mixture of water, cucumber and mint leaves in an ice tray. In the AM, you will have refreshing ice cubes that you can wrap in a soft piece of fabric and use it to gently press around your eyes. For a quicker and more elegant option, you can also invest in refreshing under-eye patches that can be kept in the fridge and slapped on at any point during the day for the extra cooling effect. Between erratic sleep pattern and general postpartum stress, it’s easy to neglect yourself and your own needs. Not only can these massive changes in your life be detrimental to your mental state, they might also manifest themselves on your skin in various, not-so-appealing ways. A good approach to address both stress and skin issues in one fell swoop is to set aside whatever free time you have and indulge in a lush facial massage. This will help combat a host of skin care issues, such as dull complexion, saggy skin and post-childbirth breakouts, but it will also help ease the tension that builds up in your joints and muscles as a result of stress. First thing’s first: you need to figure out which product you’ll use for your pampering treatment. The ideal formula should be slippery enough, but not too heavy, so it doesn’t clog up your pores. A good option would be to go for a cleansing balm or oil, which will not only be a good base for massaging your skin, it will also purify your pores from all the dust and grime that amasses during the day. You can gently rub the product into your skin and use circular motions to spread it around. Use your fingers to press any points on your face where you feel extra tension (temples, brow bone, jaw muscles). Partaking in this pampering ritual every couple of weeks will be incredibly beneficial for perking up your skin and relieving the anxieties that come with being a new mom. 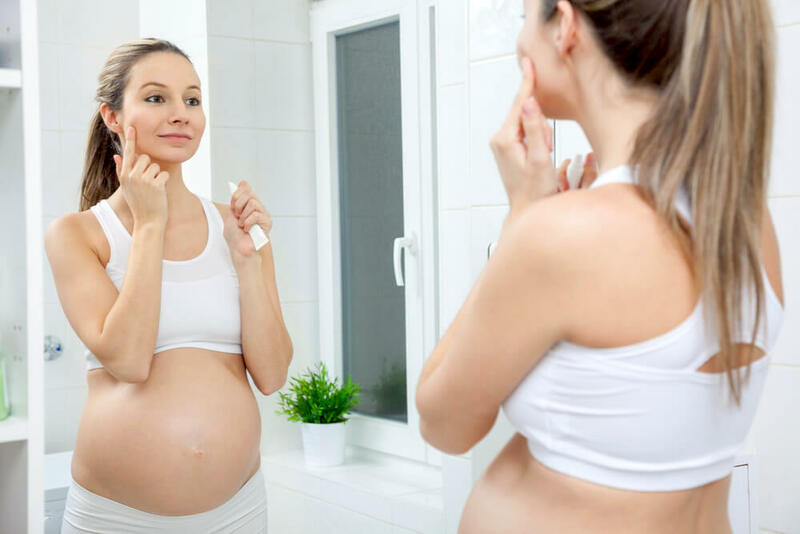 With this helpful advice, you should have no problems preserving beautiful, healthy-looking complexion during your pregnancy and in those blissful days after you’ve brought a child into this world. All you need is a tiny bit of patience and, of course, to always remember to golden rule: when in doubt, ask your doctor. Good luck! How Does Birth Control Affect Your Skin? 99 Responses to "Taking Care of Your Skin Before and After Pregnancy"
learned a lot about the different ways you should treat your skin during pregnancy. Seems like a lot of these tips could be applied anytime as they are natural and should help you look your best! Love your products. Great promotion. Keep up the great work! I did not realize how much someone could do to take care of their skin during pregnancy! Good to know for my pregnant niece. I think that these are great ideas. Great information for pregnant women. Great information! Concise, but you covered a lot. Obsessed with Orogolds 24k Moisturizer! I will not be reproducing but I sure would like to get rid of these genetic under-eye circles. Yes I do suffer lately from undereye circles, usually I use cucumber slices if I have them, but I should try the ice trick. I have to try the facial massage! I like the idea of using cleansing balm or oil to help purify your pores from all the dust and grime! I’m going to try to do exactly this -this weekend! Everything sounds so soothing for my skin! Thanks for the ideas! GREAT INFORMATION. i COULD REALLY USE THIS. Oh, yes, skin does need extra care during pregnancy. I was dismayed to have a hormonal rash for months with little advice about products to manage it. Thanks for the excellent article. What awesome info! Thanks for sharing! What a lovely product I would love to try this on my aging skin. I didn’t know that Vitamin A derivatives (acutance, retinol, Retin-a) aren’t recommended for use during pregnancy! I didn’t know that you should review your beauty products when you get pregnant for things that could be harmful. What a fabulous idea for a baby shower gift. Get the Mom-to-be some safe and still effective products. I remember those pregnancy woes of terrible skin issues. I am literally covered in stretch marks too. Really great information. My skin has not been the same after I had my Daughter ! This great advice could be followed at any stage of life, not just pregnancy as it is so important. Good stuff. Great to know! Thank you for the info! always enjoy the information and using the products. Very interisting, Nice article those Info are awsome good nice. Less is more I say. I love the information and is very helpful. Enjoyed this article , great tips. LOVE THE PART ABOUT THE BASE FOR CLEANSING ONE’S SKIN BY USING A CLEANSING BALM OR OIL…. Excellent Advice ! I can Add To with Knowledge of my own or others !!! My friend is getting ready to have a baby, so I’ll also forward this to her! This is awesome! Thank you for the information! I suffer from roseacea, not from pregnancy but from menopausal changes… fingers are crossed!!! Passing this on to my niece who just found out she is pregnant! We are so excited. I would be thrilled to win this, my skin needs some help!!! it would be nice if there were a store in Salem, Oregon where I could see the product before purchasing. Love all of your tips. My skin could use this. I want my skin to be firm. I love OroGold products!! Great info! Great informations. Thanks for sharing. This is some great information for during pregnancy. I really like the under the eye circles info. Thank you for sharing. I’m definitely utilizing the info about the bags under the eyes. I lose a lot of sleep being chronically ill and have dark circles under eyes. I can’t wait to try these tips! I’m well past the age for pregnancy, but this is certainly good information for moms and moms-to-be! Great advice! My skin used to get so dry when I was pregnant. Thank you for taking the time to publish an article for the pregnant ladies. Yes skin care is very important…. Very informative information. I especially like the info on under eye circles. These are good tips even if you are not expecting. I love this product line !!!! I like the Orogold gel deep peeling product. Very impressive. Would love to try your products! They look very effective!